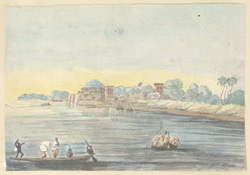 Water-colour painting of the River Ganga with cotton boats by James Tillyer Blunt (1765-1834) between 1788 and 1800. Blunt was employed on survey work with the Bengal Engineers from 1783 to 1810. This is one of 31 drawings (29 folios) of landscapes in Delhi, Uttar Pradesh, Bihar, Orissa, Madras and Mysore taken between 1788 and 1800. The Ganga, or Ganges is the most important river of the Indian subcontinent, representing life and purity to the people of India. The river flows for 1550 miles passing by some of the largest cities in the country such as Kanpur, Allahabad, Varanasi, Patna, and Calcutta before it enters the Bay of Bengal. The river was said to have descended from heaven to earth, it is regarded by Hindus as amrita, the elixir of life; those who touch the water are said to be absolved of sin.